I nearly missed a parcel delivery because one of my roommates threw out my pick-up notice, but thankfully another roommate asked what I had delivered. Some people are scumbags.. but thankfully I picked it up just in time! The parcel was Gose with Peach by Granville Island Brewing. I haven't really had any Granville Island beers lately because there's just too many beers to try now days. That said, I usually really like the small batch releases they do, especially their saison. 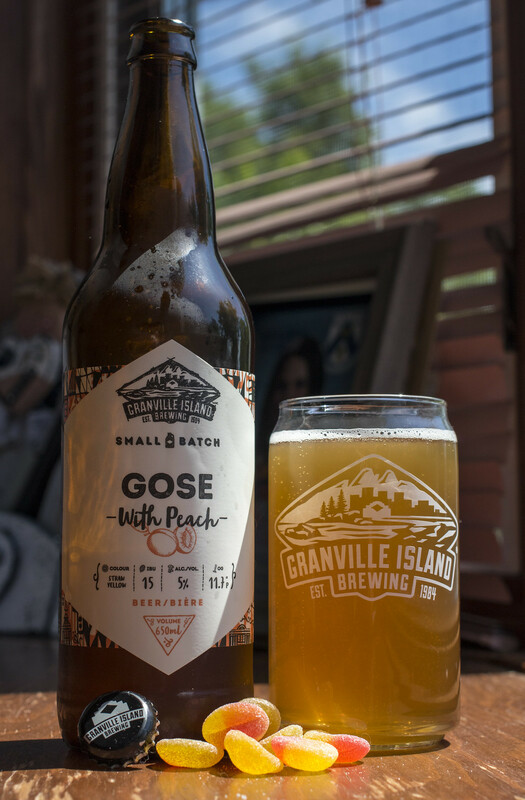 Granville Island's Gose with Peach is described as being crisp like a cider, and having ripe fruit notes from real peaches that offset the tartness of the German style. Appearance: Cloudy with an unfiltered tea-like copper brown appearance to it. Light amount of carbonation taking place in this beer and the head is incredibly minimal.. it's just a hint of bubbles here and there. Aroma: I was expecting a sour and salty profile here, so instead, I'm getting a bit of a mushy wet barley aroma with notes of peach, a hint of sourness and a sprinkling of saltiness. There's also a hint of pepper in here which surprised me. So far, this is a gose for those who don't like sour/tart goses, and there's a lot of beer drinkers who dislike sour/tart flavours in beer. Taste: The tartness you'd know and expect in a gose makes its appearance right at the beginning. It's not quite as tart as most goses out there so it's pretty easy to drink. There's a moderate sour peach flavour in there, a bit of a grainy barley porridge flavour to it, and a bit of saltiness - if this didn't have the salty aspect.. it wouldn't be a gose! The aftertaste is a light grainy yet sour taste that lingers only momentarily. Overall Thoughts: This is lighter than most goses I've had in the past few months. I've had goses that flat out made me pucker and cringe, so this is more of an ale with a light tart peach flavour, some saltiness, a pinch of pepper and a grainy barley flavour to it. I kind of expected it to be sour but in reality.. I'm not really a big fan of goses because of the sourness, so this is a nice treat. It pairs well with the Fuzzy Peach candies they accompanied with the beer. Would I drink this again? I know I will. I find most Goses are around 3.0-3.5% ABV, so seeing this topping out at 5.0% ABV is a bit of a surprise.